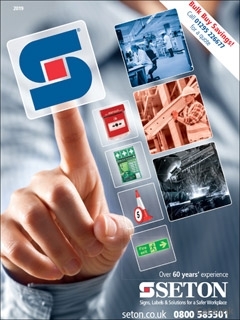 To order a printed copy of the Seton - Health & Safety Products catalogue, simply click the Request button below. Seton offers the UK's most comprehensive source of high quality workplace Health, Safety and Facilities Management Products. They offer more than 28,000 products that comply with UK and European Standards, ready to despatch same day. With no minimum order value and a no quibble gaurantee – what better way to ensure your workplace stays up to date with current & future legislation. Can't find what you're looking for? Contact their Quotes & Specials Team who are commited to the challenge of sourcing it for you. Need it customised? Seton are specialists in providing custom Signs and Labels that meet your requirements. By pressing the Request Printed Catalogue button you give consent to Seton - Health & Safety Products (and their Data Processors for the specific purpose of delivering your literature) to send you their Catalogue.